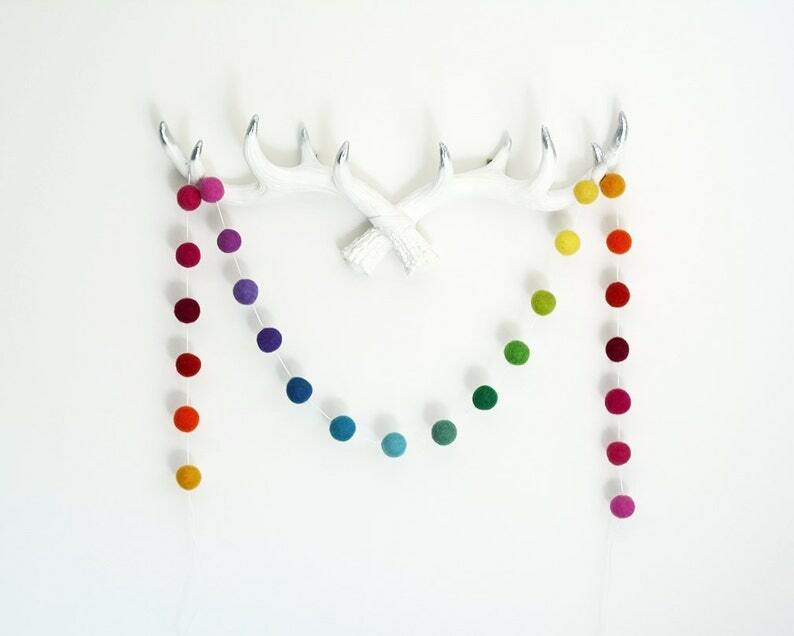 Our Full Rainbow Garland is a beautiful addition to any room or party, as a backdrop to your little one's Cake Smash or give as a Gender Neutral gift for a Baby Shower. The garland colours run through from a dark red, red, oranges, yellows, greens, blues, purples and pinks to form a full spectrum rainbow sure to brighten any corner of your home. Made by hand using beautiful eco-friendly pure wool Felt Balls carefully threaded onto a White or Red premium quality waxed cotton cord in our solar powered studio in beautiful sunny Brisbane Australia. No knots had been made on the thread so you are able to move the balls to your required spacing - the felt grips the thread so the balls will not move by themselves. The balls are average 23 mm (1 inch) in size and are created under Fair Trade conditions by wonderful women in Nepal. Extra length is left at end of the garland for tying or you can also space the balls slightly further apart to expand your garland an extra .5 meter. The extra cord can be used to form a loop for hanging over hooks or tie a knot at the last ball and cut the excess cord for a cleaner look when draping over pictures or shelving. If you are after a specific length that is not listed, please use the 'Request a Custom Order' button and we can arrange a Custom Listing with your specific requirements. Payment can be made via PayPal or Etsy's Direct Checkout. If you are not completely happy please let me know within 14 days of receiving your package to discuss exchange / returns / refunds. Items to be returned in original unused condition and packaging. The Buyer is responsible for all return shipping costs unless the return is the result of shipping damage or a mistake on my side. Refunds on custom orders will be assessed on a case-by-case basis. ★ Most AUS orders ship from Brisbane within 3 BUSINESS DAYS (Mon-Fri) after the purchase. Delivery averages 2-6 business days to AUS destinations. Express Post available on request. KirraKai cannot guarantee exact delivery dates. Any AusPost mail delays are out of my control. Custom orders will not be refunded if they do not arrive when you need them, please reach out to me for the option of Express Post to give the best chance for AusPost to deliver on time. ★ International orders are sent AusPost Airmail Post. Order processing averages 3 BUSINESS DAYS (Mon-Fri). Delivery average 7-14 business day to arrive. Any VAT & customs fees are paid by the buyer. KirraKai is not responsible for delays due to customs. International orders do not come with tracking information in order to save substantially on shipping costs, should you wish to have your order shipped with tracking please choose to upgrade your shipping at checkout. For the fastest delivery options - message me for a quote on International Express or Courier International shipping (starts at AU$43 for small parcel https://auspost.com.au/parcels-mail/calculate-postage-delivery-times/#/ ). KirraKai cannot guarantee exact delivery dates. Any mail delays are out of our control. Custom orders will not be refunded if they do not arrive when you need them. ★ I only ship with Australia Post, so I can only give estimated delivery times. Orders are shipped Monday-Friday, my local post office is not open on weekends. ★ You will get an email when your order ships. Please note - if tracking is provided it may not be available immediately for your package. If you don't see tracking information right away, please check back later after the carrier has had a chance to process the package. ★ Occasionally items get lost in the mail. If this happens, and AusPost isn't able to find the package, I can reship once the estimated time frame has passed. Sometimes mail can just be delayed. If a package is delivered but stolen, customers must contact their local post office or police and file a stolen mail claim. ★ Please make sure the shipping address is correct when you place your order. ★ I can ship to a gift recipient if you list that address when the order is placed. I do not include invoices with any orders. I can also include a handwritten gift note upon request. My products are made by hand in sunny Queensland Australia in a smoke-free solar-powered studio. Please contact me with any questions you may have or for custom orders using the Etsy convo/ contact link. 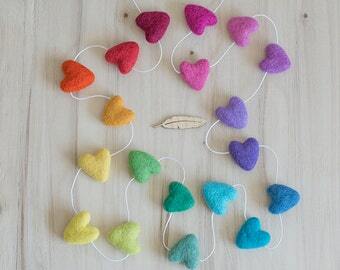 Felt Balls/Hearts/Stars - Each Felt Ball has been made by hand in Nepal from 100% pure wool, free of chemicals and are dyed with non-toxic dyes. Please note that the size and color may vary a small degree but adds to their unique individuality that distinguishes handmade items. We are always happy to send gift items straight to a friend, or family member direct, just let me know if you would like a special greeting added to the back of our card. 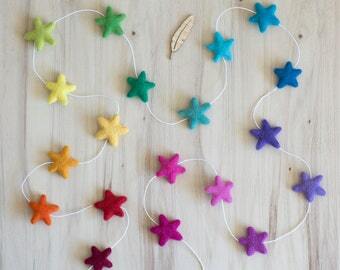 Our Garlands are wrapped in White Tissue Paper and come decorated with a felted Heart or Star. Our Mobiles are wrapped in White Tissue Paper inside a protective box and come decorated with a felted Heart or Star.